-organic fertilization: liquor (1%, 9 % N, made with horn meal). Chemical und physical parameters of the substrate, such as water holding capacity and solubility of micronutrienD. Fresh and dry weight of shooD and rooD for both cauliflower and tomato seedlings. In addition, the height of the tomato seedlings was measured. Micronutrient content of tomato and cauliflower shooD. A multifactorial analysis of variance was performed on each experimental factor (zeolite, compost, fertilization) and on their interactions. Example: The interaction "Zeolite * Compost" is significant, if the effect of zeolite is different with or without the addition of compost. Both roots and shoots exhibited increased weight with the addition of zeolite and compost. Without compost, the beneficial effect of zeolite was more pronounced. 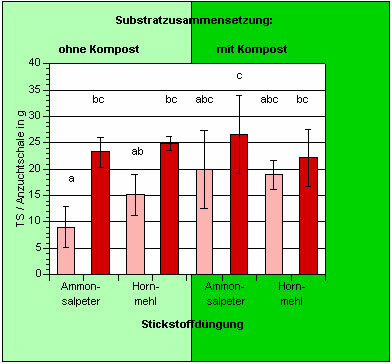 The dry matter share of the shoot is increased with the addition of compost or ammonium nitrate. 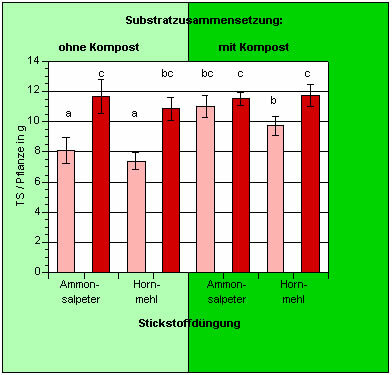 While the effect of zeolite is small if compost is added (+3 %), yield can be greatly increased (+34 %) in the absence of compost. Most results of the tomato experiment were confirmed by the cauliflower experiment. In addition, the germination rate for cauliflower was detrmined: with zeolite and without compost, germination of cauliflower was significantly higher. A final evaluation of the effect of zeolite on seedling production can only be drawn after all outstanding data is available for analysis. These parameters are the physical quality of the substrate, micronutrient solubility in the substrate, and microntrient content of the plants at the end of the experiment. In this experiment, zeolite has improved seedling growth. This beneficial effect of zeolite was more pronounced in the substrates without compost. The source of nitrogen fertilization had no influence on plant growth. Shoot dry weight showed the biggest differences.